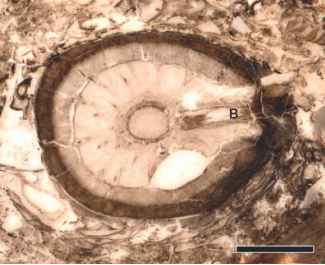 figure 7.14 Longitudinal section of Zea mays xylem showing annular (A) and helical thickenings (B) (Extant). Bar = 60 pm. figure 7.15 Sieve elements (S) and companion cells (C) in Cucurbita sp. Note conspicuous sieve plate (Extant). Bar = 50 pm. At maturity companion cells exhibit dense cytoplasm and have numerous protoplasmic connections with their associated sieve tube member. Physiologically, companion cells are thought to control movement of solutes into and out of the sieve tube member. 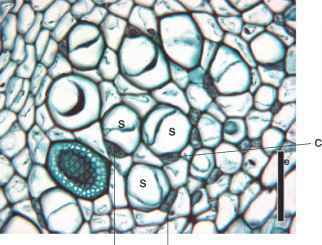 The corresponding cell in gymnosperm phloem is called an albuminous cell, but it does not develop from the same initial cell as does the sieve cell.